It’s crunch time. Having been engaged by your Awareness content, helped and educated by your Consideration content, your prospect is ready to make a choice. Chances are you've been shortlisted by this point. Yes, you can brag a bit. It's finally time to talk about you. Now is the time to talk about why your company’s offering is different. The affinity, trust and loyalty you’ve been building through the process should start to really work in your favor. At this point in the process, you should be working closely with your Sales team to turn your lead into a new client. What type of content should I provide in the Decision stage? 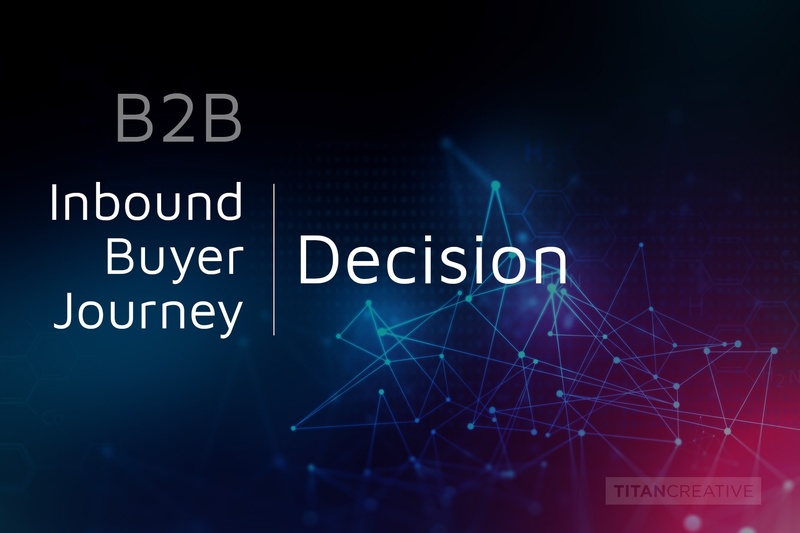 Just like the other stages of the Buyer’s Journey, it’s crucial to provide real value at the Decision stage. It does not mean switching to traditional marketing material. Rather, you are continuing the larger conversation that was started back in the Awareness phase, in a way that is completely focused on addressing your prospect's challenges. Content delivered at the Decision Stage is geared towards closing the sale - making your prospect comfortable and ready to take that next step. As such, free trials, consultations and demos are the most popular options to bring your products or services to life, and show - in tangible terms - how your solution will impact their business. A free consultation should not be a generic, one-size-fits-all offer – it should be tailored to your buyer’s business and should aim to help them solve a specific problem. When do they become a lead? You can identify leads that are at Decision stage by looking at when they start engaging with you more actively. Monitor your social media channels, blog comments and incoming emails to the Marketing inbox - who’s asking questions about implementing your product, or about costs? These are signals that they’re close to making a buying decision. They might also be responding to calls-to-action (CTAs) that are likely to bring them in direct contact with your Sales team. This might include applying for free consultations, filling out ‘Contact Us’ forms or requesting a demo. If you’re not sure when your leads are moving into the Decision Stage, look backwards. What behaviours did your most recent sales exhibit before they made the decision to buy? Since you’re likely to be considered alongside other companies that provide similar services, the Decision Stage is a great time to highlight your value proposition with clarity. What do you do better than anyone else, and how can you show it? Now is the time to differentiate yourself. While you’ll be setting up these decision stage offers with lead magnets and landing pages, the sales team will most likely be handling outreach. Help sales out by making sure your offers are clear. Ask qualifying questions as part of your form submissions. Show sales that you are focused on helping deliver MQLs that are likely to convert to SQLs. Who is going to follow up with them and within what timeframe? What are the steps involved and how long do they take? Who can offer direct support or answer questions during the process? What if the prospect doesn’t covert? If your lead becomes a client at the end of this process – congratulations, you’ve played an important part of bringing them through the Buyer’s Journey. If not, don’t worry too much – this process is a combination of art and science, and you’re probably not going to win them all. Don’t just give up though – ask your sales team to do some intel gathering on what's happening with your prospect. Are they still they still in Consideration? Perhaps they had a re-org and the timing was not right? Once you know that for sure, you can go back to nurturing them and building that relationship, so that when they are eventually ready to buy, their first port of call is your organization. Always continue the conversation, and provide more content for the Awareness, Consideration and Decision stages that will help answer the prospect’s questions, build trust and keep your brand top of mind when they’re finally ready to take that next step.